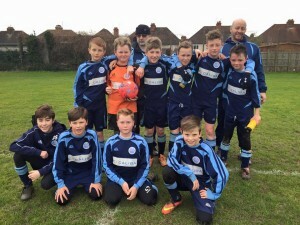 Worplesdon Rangers Football Club » Jacko’s Thriller Hat-Trick Seals the Game for U12 Warriors! By anyone’s standards, this was a game of two halves as Warriors played strong possession-based football in the first half, finding the net on no fewer than five occasions with a flurry of well-worked goals, showcasing the team at its very best. Charlie opened Warriors’ tally with a fine goal at 3 minutes, working on an Adam assist and answering the Gaffer’s request for the early goal. Adam also provided the assist for the next goal six minutes later, when Jack got on the scoresheet – his first of a hat-trick today. Keeping up the intensity of their play, Marc made it three at 10 minutes in, with Charlie providing an excellent assist from out wide that Marc was able to run onto and fire in with the side of his foot. Jack kept up the width out on the left and was rewarded again for his efforts in the 12th minute – no assist necessary but his shot was helped by the upright which took the sting out of the ball as it then trickled over the line. Warriors’ could smell goal at this point and it was no surprise that they scored again almost exactly a minute later, Jack adding his third from a Joe assist and a ‘keeper fumble to make it 5-0. The second half saw some good football but there was a suspicion that Warriors had eased off by half-time with the score at 5-0. The back line was still strong, Warriors still won a lot of balls in midfield and the attacking partnership still created chances in the final third. However, work-rate and intensity noticeably dipped and it was to Twickenham’s credit that they kept themselves in the game. There were some good individual performances today, in addition to Jack’s hat-trick. Alejandro had his second exposure to League football today and nearly scored from just inside the area, witness a fine defensive run one-on-one by Alex, complete with a superbly-executed Cruyff turn to beat his opponent – and some excellent defensive heading by Jacob in the first half. Three important points in Warriors’ latest unbeaten run – well done guys! Thanks also to Luc Horncastle for getting out of bed at 0945 to step in as emergency lino for a 10.00 ko!